Why give someone a single still framed picture when you can give them an entire slide show? The MF-575 is an inexpensive hi-tech digital photo, MP3, and video player with a bright, high-resolution 5.6-inch color TFT screen. 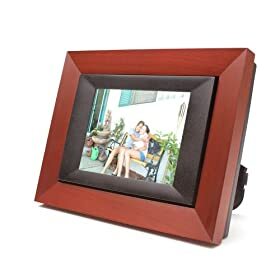 When I bought my first MF-575 picture frame, I got it as a gift for a family member who liked to complain that I never send them pictures anymore. The problem is, I have a digital camera and haven’t gotten any pictures developed in several years. So now, whenever I go over to their house for a visit, I just bring an extra memory card from my digital camera full of new pictures. If you don’t have an extra memory card, the MF-575 has an easy-to-use MD/SD/MMC memory card reader that plugs into any computer with a USB port. So you can just plug the entire picture frame into your computer and copy the pictures onto the card that way if necessary. This year on Christmas morning, I was thinking about taking a series of pictures while everyone is opening their gifts. Then I’ll take the memory card out of my digital camera and pop it into the MF-575 picture frame for an instant slide show for everyone to enjoy on Christmas afternoon. Good idea right? The number of images you can put into your MF-575 slide show is only limited by the capacity of the memory card being used.